Indoor and outdoor tracks offer man-made surfaces that can sustain a lot of usage, function in all weather conditions and help improve athletic performance. Cost, location, resources, frequency of use and maintenance are all considerations that go into the construction of a track surface. No ideal surface exists. You must choose your surface according to your own personal running or construction goals. 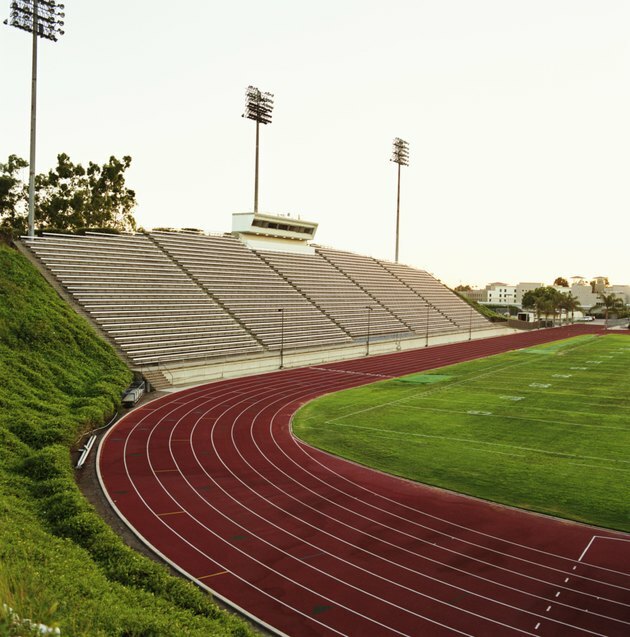 Running tracks are one of the oldest forms of athletic “equipment” and may be constructed indoors or outdoors. Standard size for a track is 400 meters—two and a half laps equal one kilometer. Tracks offer runners the ability to perform focused speed and precise distance work. The surface of a track is usually softer than concrete or asphalt and more predictable than trails, reducing the chance of injury. Tracks were once almost exclusively composed of cinder or clay, and occasionally of grass. These types of surface are softer on runners' joints, but also create more resistance--making runs slower. Weather often renders these natural surfaces unusable, as they become too soggy following substantial rain. Because of the maintenance requirements involved and increased cost of transporting materials to build these tracks, they are no longer commonly produced. The first synthetic tracks were constructed in the late 1960s using asphalt and sand. Although many asphalt tracks are still in use, their production has ebbed significantly because of material cost and surface unpredictability. The weather changes the dynamics of the surface--the heat of summer creates a softer surface, while the winter track is quite hard. As asphalt ages, it becomes harder and may, over time, be no more beneficial for a runner than running on an asphalt road. As an alternative to cinder, clay and asphalt, modern synthetic materials that are environmentally and user friendly have been developed. A surface known as “solid polyurethane” is made by casting polyurethane and rubber granules. It can be used for both indoor and outdoor applications. The porous surface track consists of a base mat composed of black granules and a binder, covered by a porous layer coated in a texture spray. Water easily soaks through this type of surface, creating a softer feel. A sandwich surface combines porous and solid polyurethane surfaces. Made up of a soft base, it is topped off with a hard polyurethane layer. Each type of track offers benefits. The solid polyurethane track surface creates a very fast track. It is often chosen for competition-grade tracks because it is impervious to mother nature and is extremely durable. A porous track provides greater cushioning and protection from injury. The sandwich track is cost-efficient and is thus commonly used.